Few things in this world can make you feel as cozy and warmed to the core as a heated robe. A creamy cup of hot cocoa or a robust cup of coffee doesn’t come close to the comfort of being completely wrapped in warmth. Since most of these robes are made out of extremely soft and plush fabrics, it makes most of us want to slip into one in the fall, and stay there until all of Winter’s snow is gone. 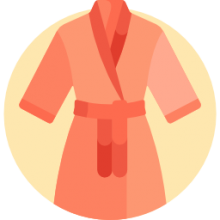 If you frequently get chilly while working on the computer, or sitting in your favorite chair, a heated robe might be the perfect thing for you. What Is A Heated Robe? Sleeved Blanket to be worn backwards: Designed in the U.S.A, Catalonia Deluxe Reversible Micro Fleece Sherpa blanket with sleeves cover shoulders, arms and keep hands free, will not slip down.Opening in the back. 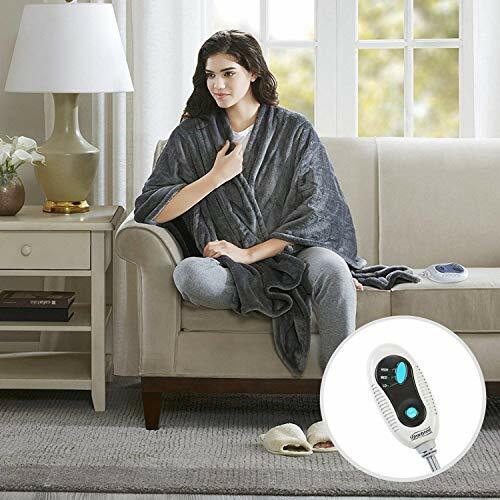 TV Watching Robe Blanket : This wearable blanket helps you stay warm from head to toe during winter while you are reading, playing, studying, watching TV on bed, sofa etc.Front Pouch to carrier your phone or remote. People who purchased heated robes in the past had these insights to share when shopping for a quality product online. Before you buy, check the description, questions, and reviews to be sure that the robe doesn’t shed. Otherwise, your floors and furniture could be covered in lint and fluff in no time. Also, check out the measurements of the wrap to be sure that it will cover and warm you properly, otherwise part of you may be left out in the cold. If you’re a taller person, this is a very important thing for you to look out for. If your wrap needs to be plugged into a wall socket to stay warm, make sure to check the power cord length to ensure it will reach from your chair or bed to the plugin. Thoroughly check the washing instructions before ordering. If you need to be able to throw it in with the laundry, check to ensure that the robe isn’t hand wash only. Many of them do require hand washing, because of the insulated cord that heats the blanket. Some of the wraps also specify that you need a top-loading laundry machine to wash it because side-load washers will damage the product. The final and most important tip that buyers suggested is checking the listing reviews and company reviews before committing to buy. Some brands or models are prone to failure. One common complaint to keep an eye out for is uneven heat distribution. This can happen if there is damage to the insulated cord during manufacturing and shipping, or if the materials used are cheap and fragile. Another common complaint is the eating controller malfunctions. This can also be caused by cheap materials, or damage of the controller during manufacturing, causing the wires and solder on the inside of the controller to break away from the logic board. Remember to always take your safety into consideration before choosing a heated robe. A heated robe is a type of heated clothing, usually a wrap or wearable throw, that you are able to wear like a long jacket or a poncho. The heat comes from the insulated cord that is sewn inside the fabric. The insulated cord is sewn into place in a strategic pattern to disperse heat evenly throughout the garment. Usually, in a wide-looping zigzag pattern, to keep the cord from getting pinched or bent at any severe angles. The insulated cords attach to a wall socket plugin and small controller on the outside of the wearable throw. To utilize the heating effects, and for the insulated cord to work, the robe needs to be plugged in. Some wearable blankets utilize USB plug-ins, rather than a wall outlet. The controller usually has multiple heat settings; such as low, medium, and high. This way, you can find the temperature that best suits your needs. Some of the higher end models offer four settings to choose from, to really dial in your perfect temperature. They are usually made out of very soft and luxurious feeling fabrics, so the feeling against the skin is enjoyable, and not itchy or abrasive like some sweaters can be. Common fabric types used are sherpa, fleece, polyester, microfiber, and micro plush. 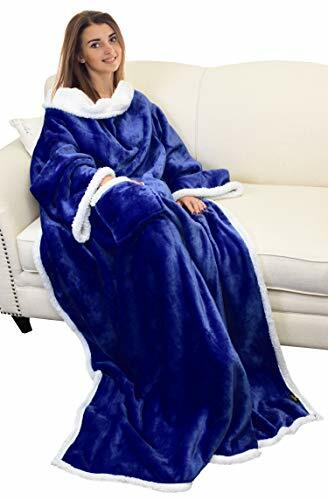 A lot of people buy heated robes to keep them warm while they work on the computer, watch tv, read, or do any number of other activities from their favorite chair. Heated robes can be great for hobbies like knitting, crocheting, and puzzles. If you’re looking to buy one for yourself, Amazon is a great place to start. Since they are the largest online retailer, they have a wide selection to choose from. Shopping through Amazon makes finding a quality product easier because dozens – or hundreds – of customers have already purchased the product and left detailed reviews. By reading through these reviews, the description, and the “Customer Question & Answers” section, you can easily gather all the information you need. Amazon also has a convenient flag called “Amazon’s Choice”, which appears next to their most popular and highly rated products in each search. The Amazon’s Choice products are usually great picks because someone else has already checked to ensure that it’s a quality product that lots of people have purchased and love. This way, you don’t have to do as much careful research. If you’re shopping for a heated robe, Bed Bath and Beyond also have a couple to choose from. Though nowhere near the inventory selection of Amazon, the Bed Bath and Beyond robes are still high-quality options. 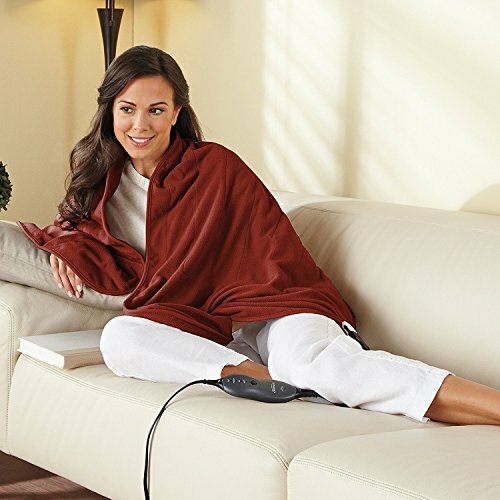 Bed Bath and Beyond offers the Therapedic Warm Me Up Electric Heated Wrap. It has a three and a half star rating, with reviews from over one hundred previous customers. It has four heat settings and is made out of polyester. 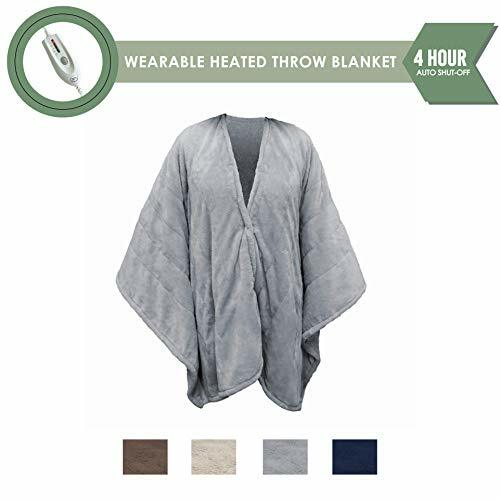 They offer the wearable throw in three colors; Black, Ash, Navy, and Taupe. As of the time of posting of this article, the Black color is currently on sale. 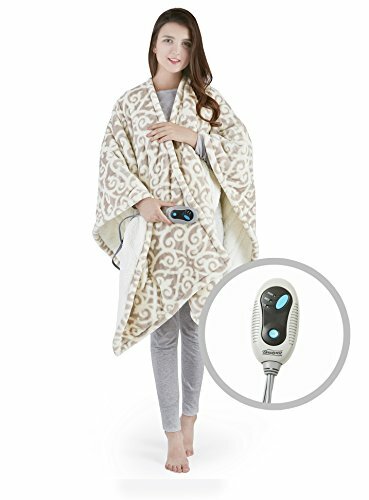 Cordless, or battery powered robes, are one of the most sought-after pieces of comfort wear. Unfortunately, finding them is quite a bit harder than a quick search on Amazon. The only company that made purely battery powered – and completely cordless – wraps was called Thermarobe. Their products are currently unavailable on Amazon and their website is also no longer reachable. Hopefully, they will work out any problems they may have had, and restock soon because their product would be in very high demand.